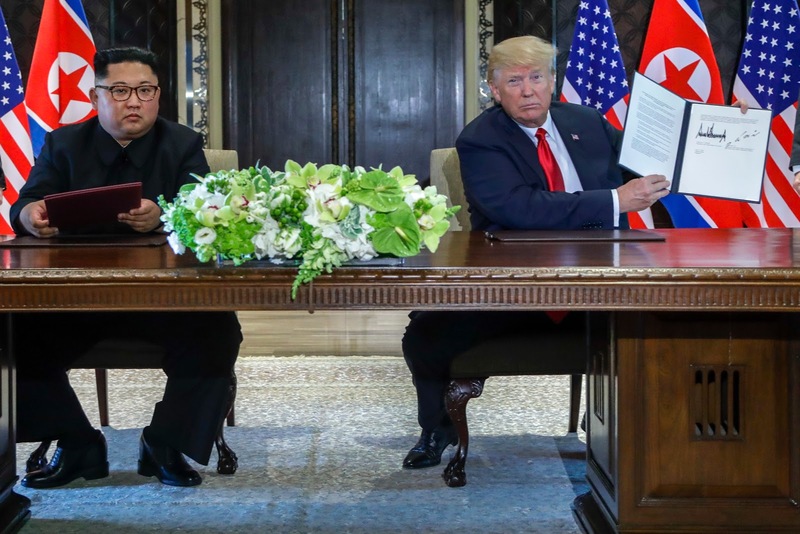 U.S. President Donald Trump with North Korea leader Kim Jong Un just signed at the Capella resort on Sentosa island Tuesday, June 12, 2018 in Singapore. President Trump met "Little Rocket Man" but many worry his efforts to end the North Korean crisis may fail to launch anything meaningful. The administration earned praise in some circles following the Singaporean summit, that offering hope that a relationship between best known two archenemies for threats of mass destruction may reach a diplomatic breakthrough. A statement from the International Campaign to Abolish Nuclear Weapons, which received the Nobel Prize after slamming the nuclear-laced threats between Trump and Kim, praised them for "achieving history dialogue between the U.S. and North Korea, which is the only pathway to nuclear disarmament in the face of fire and fury." Trump declared success after a summit with North Korean leader Kim Jong Un that resulted in an understanding that Pyongyang would work toward denuclearization and the U.S. would end joint military exercises with South Korea. Mr. Trump and Kim signed a document agreeing to a handful of key provisions. U.S. President Donald Trump’s declaration on Tuesday that he intended to end joint military exercises with South Korea took South Korean and U.S. military officials by surprise. Although the Pentagon said Defense Secretary Jim Mattis was consulted ahead of time, current and former U.S. defense officials expressed concern at the possibility that the United States would unilaterally halt military exercises without an explicit concession from North Korea lowering the threat from Pyongyang. “I’m sort of stunned about how much we gave up and how little we got in return,” said one former official, saying the decision “borders on irresponsible” and would erode readiness and diminish the credibility of the U.S.-South Korean alliance. Trump made the remarks at a news conference after his summit with North Korean leader Kim Jong Un in Singapore, calling war games expensive and “provocative” - echoing a North Korean criticism that the United States had long rejected. US and South Korea's warplanes taking part during 11-days Max Thunder drills. A spokeswoman for U.S. military forces in Korea said they had not received any direction to cease joint military drills. The move could diminish the U.S. military’s ability to “fight tonight,” a term American commanders have used for years to describe the heightened posture of U.S. forces in one of the world’s most-sensitive military flashpoints. Even during budget cuts under Trump’s predecessor Barack Obama that eroded readiness elsewhere in the world, the Pentagon prioritized exercises on the Korean peninsula that included everything from air combat to infantry drills. The U.S.-South Korean exercise calendar hits a high point every year with the Foal Eagle and Max Thunder drills, which both wrapped up last month. Max Thunder’s air combat exercises so unnerved North Korea that it issued threatening statements that nearly scuttled the summit. Foal Eagle is designed to simulate war scenarios and involves ground, air, naval and special operations forces. Asked about the plan to halt exercises, a U.S. official who spoke on condition of anonymity shrugged and called it a political, not military, decision. The Pentagon declined to flesh out Trump’s remarks about suspending drills, a move the U.S. military had long resisted, saying it was working with the White House, U.S. allies and partners “on the way forward following the summit.” Pentagon spokeswoman Dana White denied that Mattis was caught off guard by the announcement, telling Pentagon reporters: “There were no surprises.” In a separate statement, White said Mattis was “fully aligned” with Trump. A South Korean official said he initially thought Trump had misspoken. “I was shocked when he called the exercises ‘provocative,’ a very unlikely word to be used by a U.S. president,” the official said, speaking on condition of anonymity. South Korean President Moon Jae-in spoke by phone with Trump for 20 minutes late on Tuesday, but an official readout of the call made no mention of military exercises. South Korea said last month the issue of U.S. troops stationed there was unrelated to any future peace treaty with North Korea and that American forces should stay even if such an agreement were signed. China, historically North Korea’s closest partner, has also sought a “freeze for freeze” agreement in which the exercises would be suspended in exchange for North Korea’s stopping its weapons development. The United States had rejected such proposals in the past, but North Korea has unilaterally declared an end to testing its nuclear weapons and ballistic missiles, and now Trump appears ready to end exercises while talks are ongoing. Given Kim only repeated vague commitments to pursue the ''denuclearization of the Korean peninsula,'' some experts questioned whether Trump was making excessive concessions. “I hope - but am not yet confident - that (North Korea) will take steps that match the concessions Mr. Trump has already made by ending military exercises in South Korea.